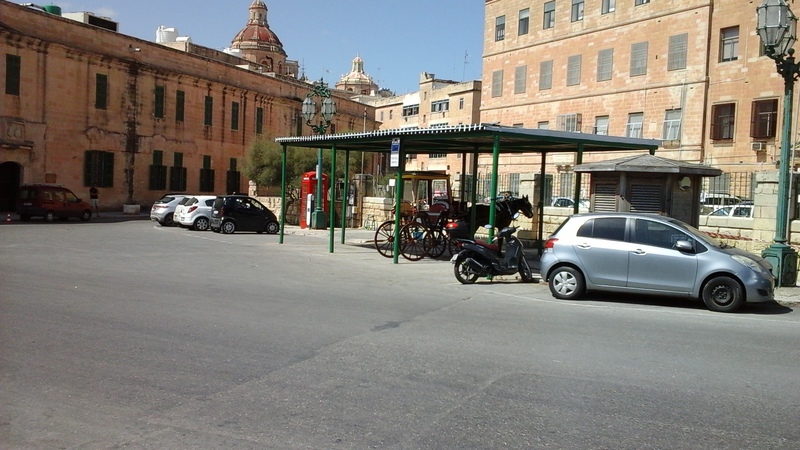 Last Monday, September 14th, we had one of our many trips into the city of Valletta. 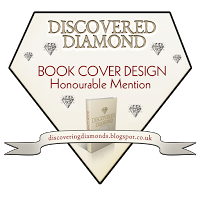 I had intended to do this post whilst we were still in Malta but, unfortunately, time did not allow. So here it is now . . . 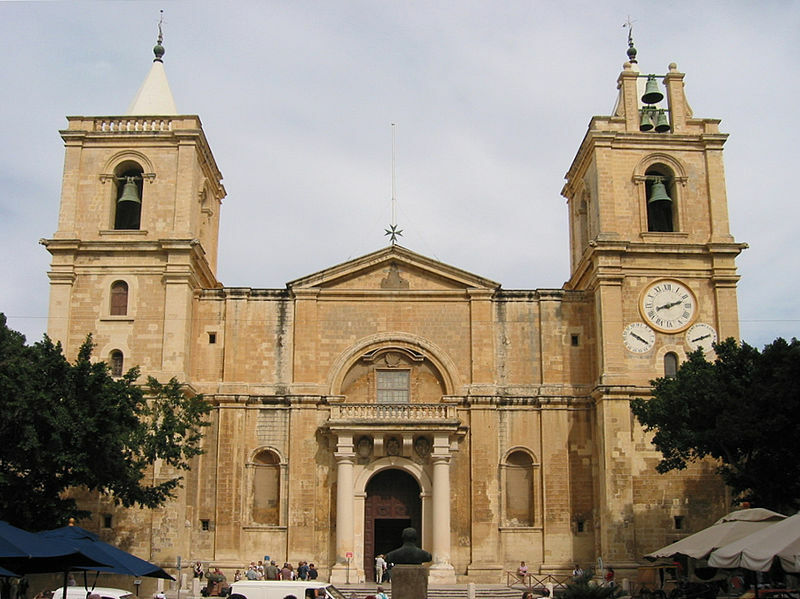 Built on the Sciberras peninsula in the central-eastern part of the island,Valletta is the capital city of Malta. With a population of only 6,400 (in 2014) it is Europe’s smallest capital. It was described by Sir Walter Scott – who came to the island on doctor’s orders in 1831 – as ‘a city built by gentlemen for gentlemen’ and ‘that splendid town quite like a dream’. The colloquial name for Valletta is simply, ‘il-Belt’ (The City). Valletta is a city rich in sites to see, with historical buildings and wonderful statues, fountains and coats of arms at every turn. In 1980, it was officially recognised by UNESCO as a World Heritage Site and in 2012 it was named as European Capital of Culture for 2018. 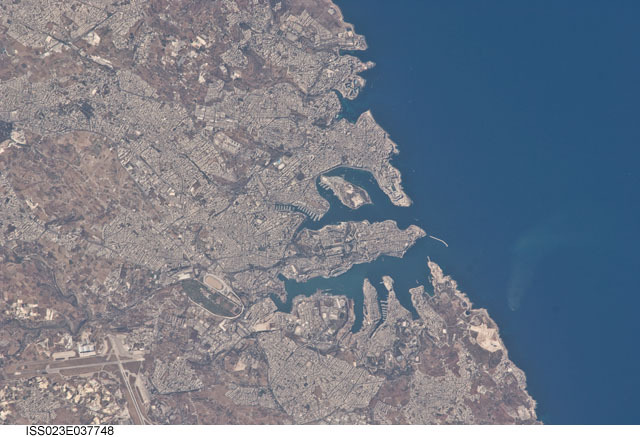 Satellite view of Valletta. Author: NASA Astronaughts. Uploaded by Aresceo. Public Domain. 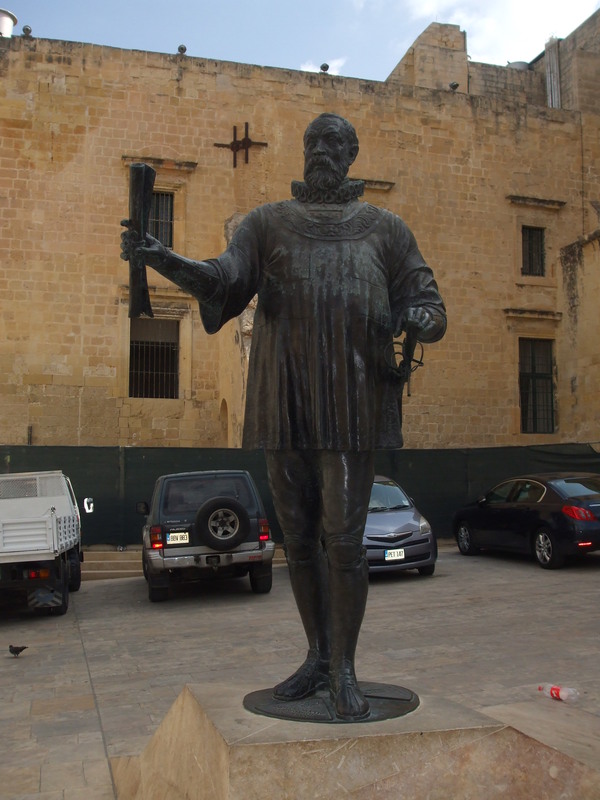 The foundation of Valletta dates back to 1566 when Grand Master Jean Parisot de la Valette (statue of him, above) laid the first stone. Following the attacks by the Ottoman Turks in the ‘Great Siege’ of the previous year, Valette knew that the island’s defences greatly needed improving. He decided to build a new, well-fortified capital next to the already established watchtower at Saint Elmo Point on the tip of the Sciberras Peninsula. The city was originally planned as one of winding streets and alleys but, in order to speed things up, a grid design was adopted – which is still seen today. One of the main buildings along Republic Street is St. John’s Co Cathedral, described by Sir Walter Scott in 1831 as a ‘magnificent church, the most striking interior I have ever seen’. We didn’t take a good photo of the exterior, so here’s one from Wikimedia Commons, by Radoneme . . . The interior is stunning, but I won’t go into that now, except to say that it was decorated by Mattia Preti, and some of his great pieces of art are also displayed there. But perhaps the most famous piece of art on display is by Caravaggio – whose own life story is fascinating, tempestuous – and very controversial. The Great Ditch that surrounds Valletta on the landward side was dug and the excavated stone used to build the bastions on that side and also for buildings. Valletta is well worth visiting. Every time we go we find something we hadn’t seen before. There are many museums, and the lovely gardens Barrakka Gardens . . .
. . . and much to see of the defences along the harbour – which I can’t include in this post. To finish with, here’s a photo of one of the sun shades for horses that pull the carriages for transporting tourists around. The sun shades are relatively new, and I believe they’re a result of complaints from people regarding leaving horses standing in the sun for hours – as happened in Mijas in Andalucia, with the donkeys. I wrote about that in May [here]. The carriages get a lot of use, particularly by people who visit the fort and coastal defences and find the trek back up the hill to the main city area difficult. Thanks a lot, Millie, for such a detailed and lovely virtual tour! As always your photos are amazing and gives a very precise idea about the place. Thanks again! And yea… This time difference is really funny! lol! 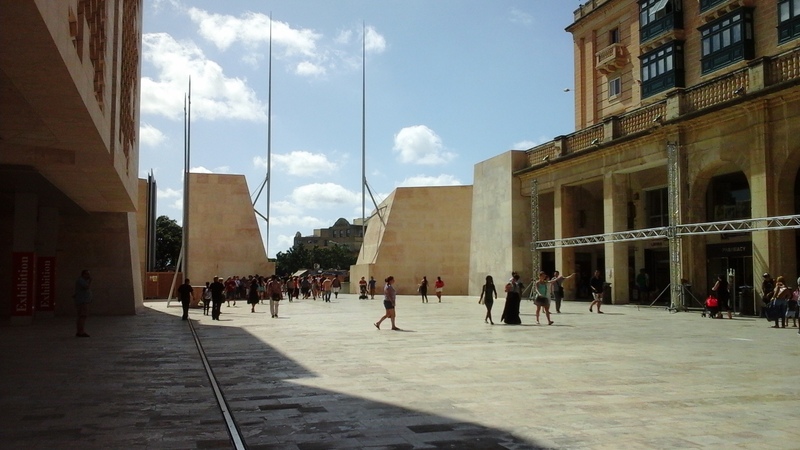 I have been to Malta and Valletta, so particularly enjoyed this post. Thank you! Having made extensive calculations, I have determined that the violet-tinted bottle with your message ended up at Saint Elmo Point. Any chance of you going back there? Yes, I know about Caravaggio’s fascinating life–all the more reason for you to return to Malta. A mathematician is nothing more than a magician toying with numbers, henceforth calculating the vectors of blue and green currents traversing the world’s oceans is well within my purview. Incidentally, the bottle will still be there next October, unless a toothless dwarf sees its iridescent sheen and pockets the keepsake for good. Incidentally, toothless dwarves in Malta are the official keepers of the secret of Caravaggio’s death. You learn this when you take a kaleidoscopic tour of Valletta in a barely functioning Melita bus–the tour guides really open up during those long, excruciatingly hot hours spent waiting for a correspondingly blue flatbed tow truck to arrive and restore normalcy the lives of her Majesty’s subjects. Well Prospero, that was certainly an entertaing comment to read. I agree with your view on mathematicians – and I love the idea of ‘calculating the vectors of the blue and green currents traversing the world’soceans’. 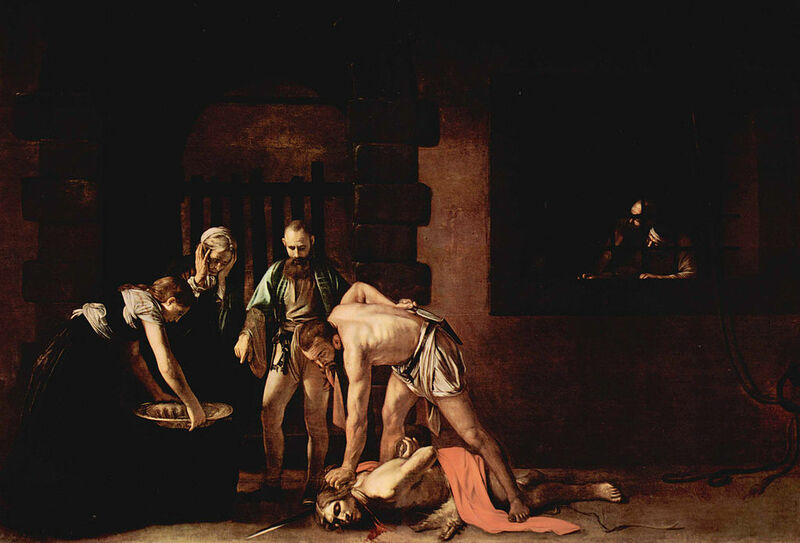 As for a toothless dwarves keeping the sectret of Caravaggios’s death, I’ll make a point of seeking out their hiding place next year. 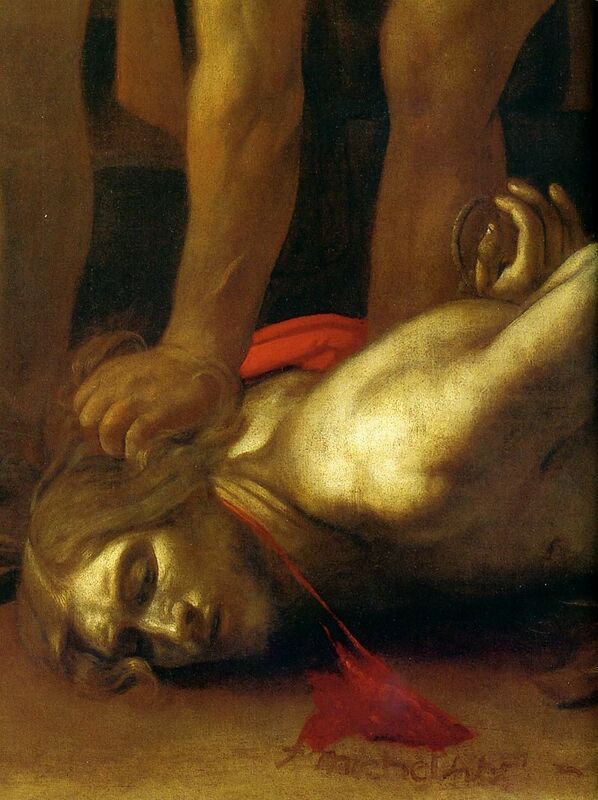 I really want to know what happened to Caravaggio’s body. But I bet even the most talkative of tour guides don’t know where those elusive dwarves hang out. Thank you for this ‘inside’ information. I’ll have a heard start on things next year. Khloe, whichever region you talk about. I don’t know if I’ve ever seen photos from Valletta before! I think this was probably the first time 🙂 I can definitely see the honey-colored stone setting the tone for the whole town – that color seems to appear in every scene. It’s a very nice color! 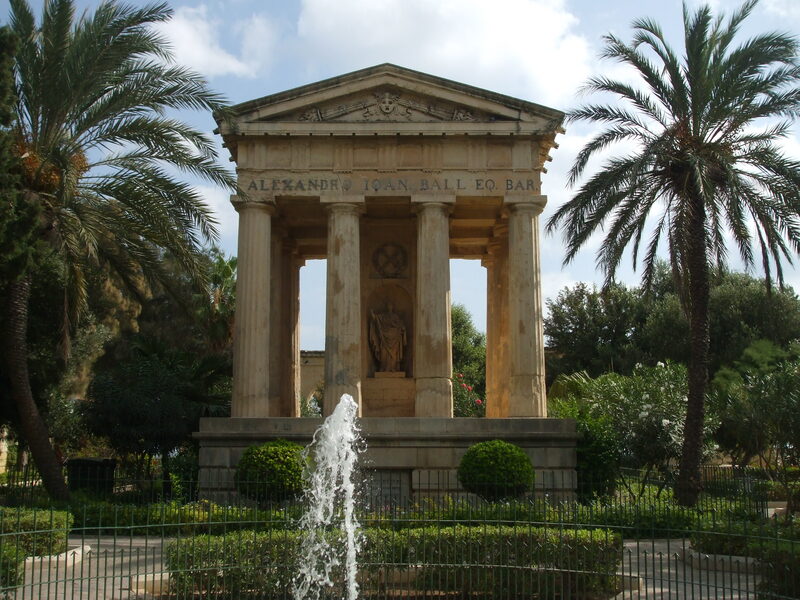 It is a gorgeous rock and is a type of limestone they call ‘globergerina’ in Malta. I didn’t have my hand lens with me, but it looks like the rock we call oolitic limestone in Britain – made of little round ‘ooliths’. The beginning of globergerina would suggest round particles, too (like globules). I’ll look it up when I find the time! But yes, It’s used for buildings all over the island. It looks so warm and really goes with the climate in Malta. If (when) you go to Argentina, there are lots of fossils there! Actual ongoing dinosaur excavations, etc. Geology is a very interesting subject, though my knowledge is very, very limited! The trouble with archaeological digs for us, is Nick. He’s partially disabled, after a car accident 25 years ago. He wouldn’t manage the constant bending and so on. If it involves just viewing the work in progress, that would be OK. We don’t know what else we’re doing next year other than a week in Italy in May. How about you? Are you going on another of your long trips again? No, no money for that right now, we’ve been investing in furniture for a change! 😉 Which is nice, too! I’m doing a short weekend trip to Paris in a couple of months, then a couple of months after that a weekend trip to Brussels. Both visits are to see friends there and are way overdue! 🙂 Might also go to Tallinn, Estonia for a weekend in December, it’s sort of a tradition. Where are you going in Italy? It’s magical. I hope you’ll love it as much as I did! We can share experiences after I’v e been. 🙂 I’m expecting it all to be amazing. 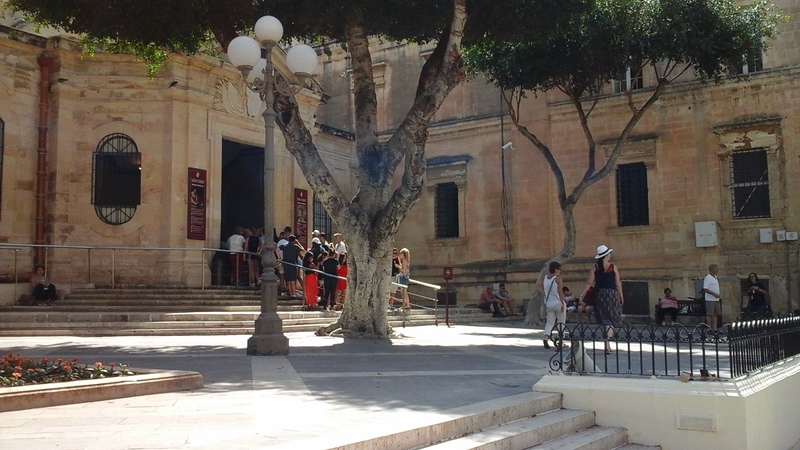 Love the photos and your excellent information on Valletta Millie. I love the shops and cafes that line the streets there.. Thanks so much Millie! Of course you always give us a wonderful tour and the most amazing photos! Such a wonderful post! I would love to go see all of these amazing things you have shown us! Thank you, Lynn. Valletta is lovely but very busy. It was packed with people during the week we were there. I’m so thrilled I can visit these most interesting historical places through your delightful post, Millie. How exciting for you to see the only painting Caravaggio signed. Was it really signed in blood? I learn so much from your posts. Thank you! I also love the photo of the brown door behind a gate. Wow! I passed by to see if you’d posted anything for Friday Fictioneers and there was this exquisite post! That crochet lace and embroidery is beautiful. And the shopping stalls and that painting of St. John. I really enjoyed this post, Millie. Are you still on your holiday? Hi Ellespeth. We got back home late Saturday night after a really great week. It was very hot and busy (still ‘high season’ in Malta until the end of September) but we did what we went there to do. We visited umpteen sites and I’ve come back armed with info. for lots of posts. I did the first two while I was still there, and about Valletta once we got back. The rest will keep me going for a while. I’ve not done Friday Fictioneers or Monday’s Finish the Story for ages and the PJ challenge will have to stop for a while now. I’m desperate to get on with Book 3. I’ll keep my WOW and history and travel posts going, but I can’t justify spending time writing stories – much as I love doing them. 😦 I really miss the Fictioneers! 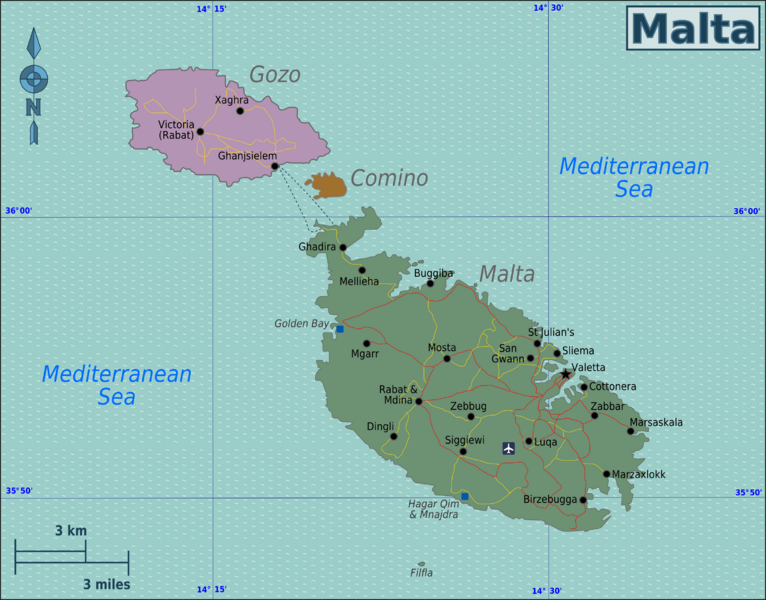 I also had the intention to visit Malta. An interesting country,beautiful description. Thanks.